Outfit: Etoile Isabel Marant Lexy jacket (similar here), Alexander Wang t-shirt, James Jeans Twiggy and ankle boots. 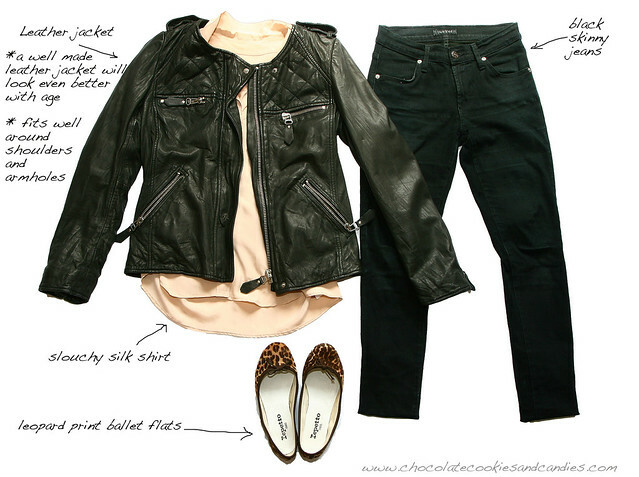 Outfit: Etoile Isabel Marant Kady leather jacket, Equipment silk shirt, James Jeans Twiggy and Repetto leopard print flats. I've never really thought much about my dress sense until a couple of years ago. It suddenly occurred to me that I've always felt my best in a pair of pants, top and a jacket even as an 18 year old. It was what I'd wear if I had to be a bit more dressed up. The outfit made me look more confident and pulled together to my usual University of Canterbury sweatshirt and sweatpants attire. I still love my sweatpants to bits but I'm wise enough to buy a skinnier version and pair them with my Kooples wedge sneakers for a more contemporary look. My so called uniform hasn't changed much in the last 20 years but thankfully, I've discarded the super large glasses that practically covered half of my face and tamed my frizzy hair that looked like a lion's mane. Little did I know that those geeky glasses would be fashionable again in 20 years. And that ladies with perfect eyesight would wear them as a fashion accessory. So......when I arrived in the UK a few years ago with two suitcases, I set about to create a wardrobe that would suit my rather pragmatic (typical of those born in the year of Ox) yet tomboyish personality and a casual lifestyle. 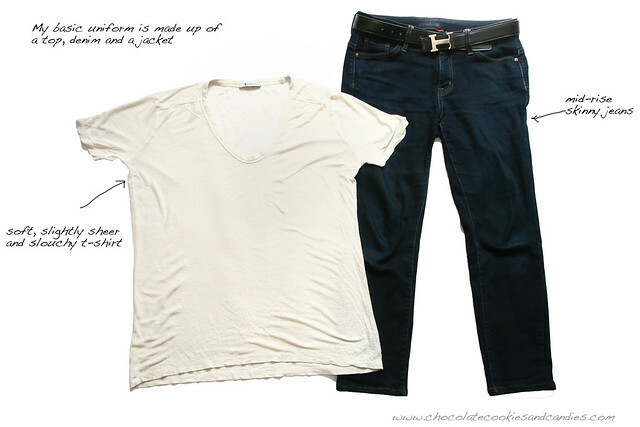 Cultivating a uniform made getting dressed ridiculously easy. It's the perfect solution for someone like me who wants to look fairly snazzy (or trying to be) but can't be arsed spending hours figuring out what to wear. It's interesting to note that fashion heavyweights such as Emanuelle Alt and Anna Wintour have their own uniforms, one that never deviates despite the ever changing climate of fashion trends. Emanuelle Alt is famous for her jackets, super skinny jeans and incredibly high heels. Meanwhile, Anna Wintour favors dresses with crew or ballet neckline with hemline just over the knee and her trademark skintone Manolo Blahnik Callasli slingbacks. What do I look for a jacket? The fit is my number 1 priority. If the armholes are too wide or the shoulders slouch and there's a puckering on the back, it goes back on the rack. It has taken me a while to understand the kind of fit that suits my body shape. Seeing that I am rather petite and have a boyish figure, single button blazers look best on me. They create an illusion of a waist and the hem falls just above my hip so it's in proportion to my height (or lack of it). Secondly, I like fabrics that do not crease. I hate ironing with a passion. In fact, the act of ironing is a form of torture and therefore, an evil entity. Moving along to my third point - the color. I generally prefer darker colors only because I'm a dirt magnet. I find it hard to relax around food whenever I'm wearing a light colored jacket. Which means I can't eat for fear of getting splattered. I don't react too well to hunger (imagine Dr Bruce Banner turning into the Incredible Hulk when angered). Lastly, I'm willing to spend a little more on jackets as long as the style is a classic. I like fashion but I certainly don't live and breathe it everyday. I tend to stick to what I believe looks good on me. Besides, I don't have a deep pocket nor do I want to flush unnecessary money down the drain by constantly replacing my clothes just because they're out of date. Do you have a uniform? What suits you best? I always feel comfortable in jeans, but I've been thinking more about establishing my style/uniform in the past couple of years. I think it's a bit transitional right now, but there are certain looks I always return to. Thanks for featuring me, that was REALLY nice of you! Your uniform sounds like mine. I am definitely most comfortable in pants, a simple tee or blouse and a nice jacket. I keep trying to incorporate skirts and dresses in my wardrobe, but I always reach for pants. I have been hunting for the perfect pair of black pants for ages, ugh. Loving the look with the leather jacket! A t-shirt and jeans are the perfect base to so many outfits. I feel that I alternate between certain aspects of what you would call my uniform but two staples in my wardrobe that I always go for are skinny jeans and boots. I love that your uniform is made up of wearable pieces that can pretty much transcend seasons and be worn a lot in many different ways depending on how you style it. It's evident that you have a great sense of your personal style. Awesome post! These are awesome. You and I have similar style. I totally agree with you on a jacket with good fit. It's so important. I had those glasses too and a fringe, all you could see of my face was my mouth! I need to get a uniform pronto, I hated my day clothes in London this weekend, and it made me feel miserable, I find every day dressing ridiculously hard to do. Yes, I'm into this uniform too . It sometimes occurs to me that in a while I may veer away into a completely different aesthetic. Skinny jeans + Anne Fontaine shirt or American Vintage T + ballet flats or riding boots has been my look for a decade . I've sold all my lovely Margaret Howell pieces :they were my uniform for the previous two decades . I remember spending a fortune on just the right tailored trousers, and never want to go there again ! I'd far rather spend the cash on Hermes accessories or a ticket to the opera ! Estrella, your decade old style is still very much in vogue and copied to this day. Couldn't agree more about spending the cash on Hermes. As for me, instead of a ticket to the opera, I'd say flights to some exotic places. Absolutely perfect post. Thank you. This is my uniform, too! Never fails! Oh how I love your new leather IM jacket - what a dream! I do like mixing up my denim with different cuts or a couple of over-dyed colors. And lately I've been mixing in a higher waisted trouser flare jean with a platform wedge. They are a nice weight for summer! The Hermes belt makes all the difference ! Ah I love this post! I totally agree about jackets. The fit, the fabric, and the price are all what I look for in the perfect jacket too. Sometimes a good jacket is so hard to find! For someone living in the tropics, my uniform is pretty predictable. I like a simple cotton or linen dress with ballet flats, or a slouchy tee with slim pants. I recently found some great staples from massimo dutti and uniqlo that fits perfectly. Same as you, I feel most comfortable in a pair of trousers, a shirt, and a jacket, with flats. When the weather is too hot this transforms in a sun dress and flats. My biggest problem is finding good jackets, 99% of them look too boxy on me, and make my neck disappear. My best bet is a soft fabric jacket and cardis. Thank for the sweet comment on my blog! Again love your selection, especially Isabel Marant leather jacket and the high tops!! Such a sweet thing to say. You're right. It took me 5 hours from start to finish just to write this post. My uniform also revolves around plain cotton Ts - they are the most comfortable and the thing I hate most at the end of the day is being uncomfy! Like you because of that I also have a big affinity for jackets and cardigans.. Throw in a scarf and you also have my fav uniform! Love all your outfit choices. Fantastic post!! I love this! Those suede boots are amazing. I probably own 50 sun dresses. If I could wear a sundress everyday, i would. I love pairing a jean jacket with a sundress, or a pair of cowboys boots, or a blazer to dress it up. Fantastic post and yes have you really should think of becoming a stylist. I would be more than happy to go with your choices. 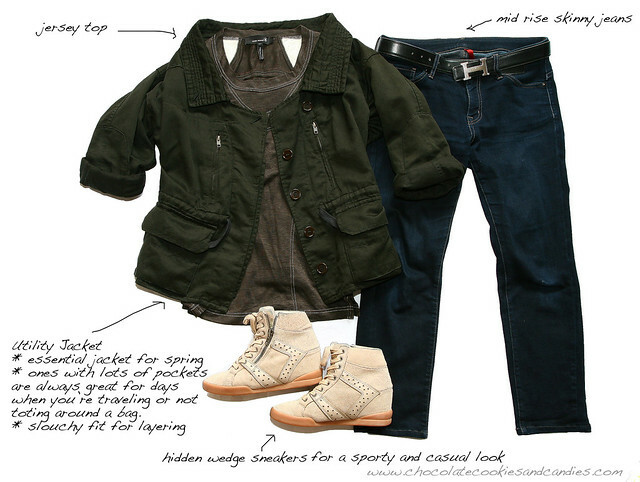 I love the last look - still love your parka and Kooples wedge sneakers. How do you manage to photograph the combinations like you do? I'm in awe. And thanks for taking the time to show us the combinations - they're well thought out. My real day to day is boyfriend jeans in the summer and skinny jeans/jeggings for the winter to tuck into boots. And they pretty much go with anything. Though instead of cultivating a uniform - I'm trying to branch out and wear a few things out of the norm for me. Thank you so much for the lovely compliment and taking the time to write a comment. Much appreciated! Brilliant looks. I could wear those everyday and be 100% satisfied and feel good about what I was wearing. I live in jeans so these are perfect inspirations for me. Thanks so much! Wonderful post. I love how you spell out what works for you and why, plus give examples from your closet. Perfect! These looks are so chic. I'm such a sucker for a great jacket, so I love these. I like your "still life" pictures. I too usually dress in 3 pieces: bottom, top, and then an outer-piece. I live in the tropics so it's usually too hot to wear a blazer casually, so I rely on knits instead. I'm a uniform girl too and very much into my jeans and jackets. I have finally started to consider ankle boots to add to my wardrobe but do wonder if I'd like them with dresses on me? I too look back and remember that as an 18 year old I always felt like "me" in jeans, a nice top and blazer. I remember Jennifer Aniston wearing that look years ago and thinking it was the look for me. I love every and each outfit !! I also have an uniform, jean, t-shirt and flats !! My uniform is a lot like yours. Tees, outer piece (sweater/jacket), and bottoms. Occasionally I'll wear a dress, but many times I'll wear an outer piece too. Definitely a jacket or blazer with skinny jeans. For summer I'm usually in black shorts and some sort of silk tank. I've been trying to mix it up and wear more dresses this year. Love your Lexy jacket!